Swami Bhajanananda Saraswati serves as the Vice President, Head Priest, and Abbot of Kali Mandir, a non-profit organization dedicated to the worship of the Divine Mother, that runs a traditional Hindu temple; a seminary training spiritual aspirants, priest and monastics; and a residential monastery. Kali Mandir follows Sri Ramakrishna Paramahansa (1836-1886), whose uninterrupted contemplation of God and subsequent spiritual realizations revealed the depth of God-consciousness that transcends all time and place and that shines at the heart of all religions. Born in Mexico and raised in the United States, Swami Bhajanananda started his spiritual search and study in his teens. In 1987, while still in high school, he met his guru, the great saint and yogi Swami Vishnudevananda Saraswati of Prayag (Allahabad) who initiated him as a brahmachari (novice monk) in 1993. He received further initiations from Swami Chidananda Saraswati, the late president of the Divine Life Society, Rishikesh, and from Sri Haradhan Chakraborti, the late head pujari of the Dakshineswar Kali temple. In 1999 he received his final monastic ordination as a Dasnami Sannyasi from Swami Omananda Saraswati, the spiritual successor of Swami Vishnudevananda Saraswati and head of Yoga Vedanta Kutir in Allahabad. 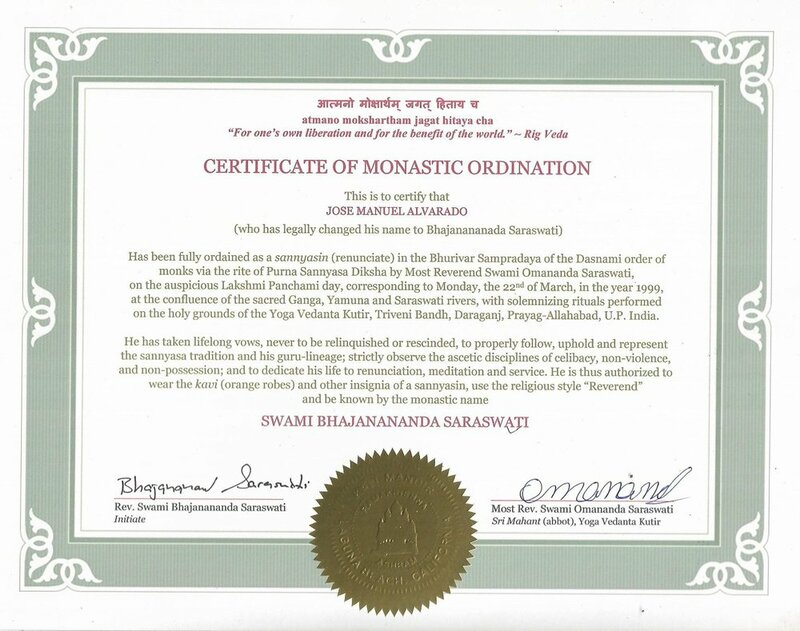 Swami Bhajanananda has a Bachelor degree in Religious Studies from the University of California at Berkeley and a Doctorate in Applied Theology/Ministry (DMin) from the New Seminary for Interfaith Studies in New York. 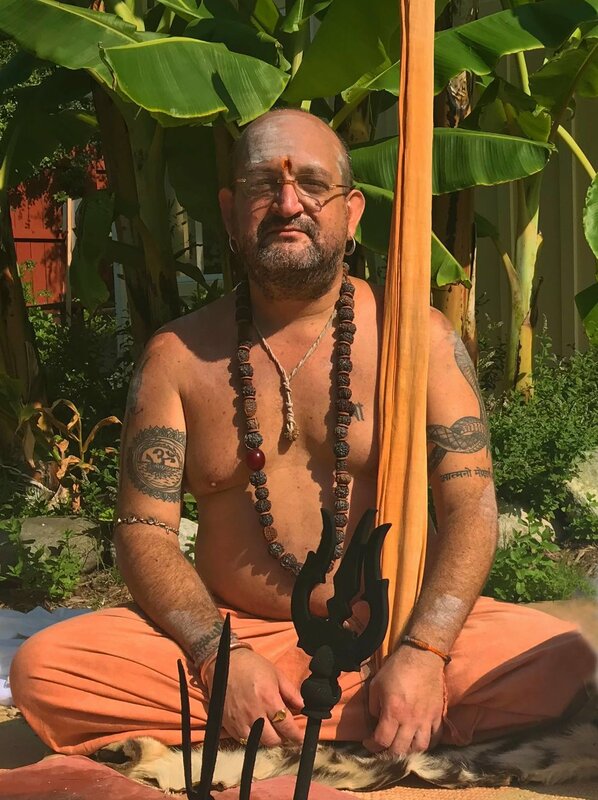 He has served as an instructor at the University of California at Irvine in their Yoga Studies Program for several years and is presently an advisor for Hinduism at the New Seminary. He has translated and authored several books, including Return to the Source, Collected Writings on Spiritual Life; recorded albums of devotional kirtan; and has spoken at universities, high schools, religious centers and professional gatherings on Hinduism and interfaith relations. He is recently featured in the documentary series Yogic Paths produced by Gaia TV. Swamiji is considered an expert in the ritual worship of the Mother Goddess as per the dakshina-marg (right handed path) of Tantra, which adheres to traditional conservative Hindu norms in the mood of selfless devotion. He regularly gives discourses on the Hindu scriptures, the teachings of the saint and sacred tradition that are available as podcast and on Youtube.